The regular Apple Watch comes in two colors, Space Black and Stainless Steel. While both Watches are constructed from stainless steel, the Space Black variation features a diamond-like carbon layer to create a deep black color. Because of its color, the Space Black version appears sleeker since all the Watch components blend to form a harmonious surface. The Space Black Apple Watch is a $100 premium over the regular Stainless Steel Apple Watch. Apple will release new Apple Watch Sport bands in a variety of colors at its September 9th media event. The new colors will consist of more neutral and darker colors to complement the current neon colors available. More colors will give Apple Watch sport customers more customization options, which will increase Apple’s Apple Watch profits. News of the additional colors first surfaced in April when Jony Ive showcased several new colors at Milan Design Week. Apple hopes the broader range of Apple Watch band colors will entice people purchasing the new iPhone 6s to also invest in an Apple Watch. The Apple Watch Milanese Loop features a stainless steel mesh that loops and closes magnetically. Since the band is infinitely adjustable, it feels extremely comfortable. The band also complements the stainless steel watch well and provides a clean modern look. Overall, the Milanese Loop provides fashion and comfort in one band. 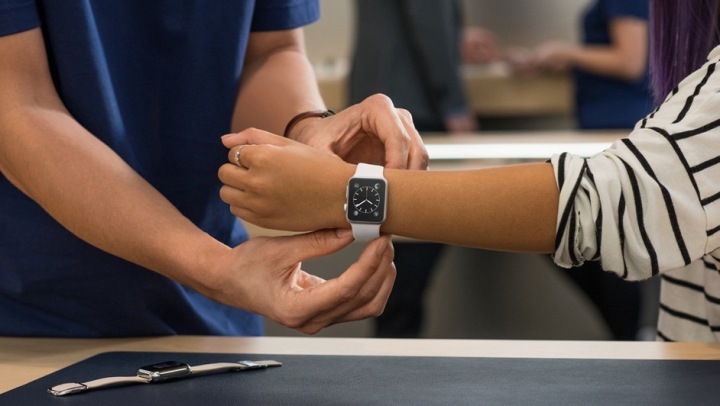 Yesterday, Apple began allowing the public to try on Apple Watches in its retail stores. Display tables with Apple Watches under a glass cover allow customers to view all Watch collections and configurations up close. To actually try a Watch on, customers make an appointment on the Apple website. The appointment reservations are similar to reserving a Genius Bar. Simply log into the reservation webpage with your AppleID and select the time you want to try on the Apple Watch. When I arrived at the Apple store yesterday, I was greeted at the door and asked for my name and reservation time. The sales associate instructed me to wait for someone to guide me through the Watch experience. In just a minute, a sales person met me and guided me to a try-on station. The try–on stations feature black leather table pads that make the Apple store seem more luxurious and suitable for selling wearables. Alongside the leather table pads are portable Apple Watch displays. The displays incorporate an embedded iPad that highlights the features of each Apple Watch app as the customer explores them on the Watch. After we arrived at the try–on station, the salesman asked me which Apple Watches I wanted to try on. Once I told him my interest in the Apple Watch Sport and Apple Watch with leather loop, he retrieved the Watches from a drawer that contained many different Watch configurations. Looking into the drawer shows how many different case and band formats customers can choose. The sales person then put the Watch on my wrist and complemented the way it looked in conjunction with my outfit. This was the first time I ever received fashion advise in the Apple Store and it sounded completely natural in the context of the Watch. The Apple Watch itself felt incredible well constructed. Although the try–on models only let customers see the Watch features through a demo, the video still allows people to feel how the Watch delivers notification with the Taptic Engine. For example, when the Watch receives a message, it feels like a tap on the wrist. The Sport Band and Leather Loop I tried on were comfortable and good looking. Overall, my Apple Watch try–on experience was very good. Apple did a great job transforming its stores to sell luxury watches. While I wish Apple would allow more freedom to explore the Watch features than a software demo, I came away from the experience with an increased understanding of how the Watch will enhance my life. I recommend everyone makes a reservation to go see the beautiful Apple Watch in person! Images of Apple Watch packaging emerged today on Instagram user Jeremy Gan’s account. The image features an Apple Watch sitting atop a sleek plastic container. A pedestal slot allows the Watch to stand up. This packaging is consistent with Apple’s sleek, minimalist boxes. While the images have many elements that make them seem authentic, Apple has not released official images of its Apple Watch packaging, so the posted pictures could be counterfeit. Also, Apple already stated that Apple Watch Edition will include a more luxurious box that can be used for charging the device. 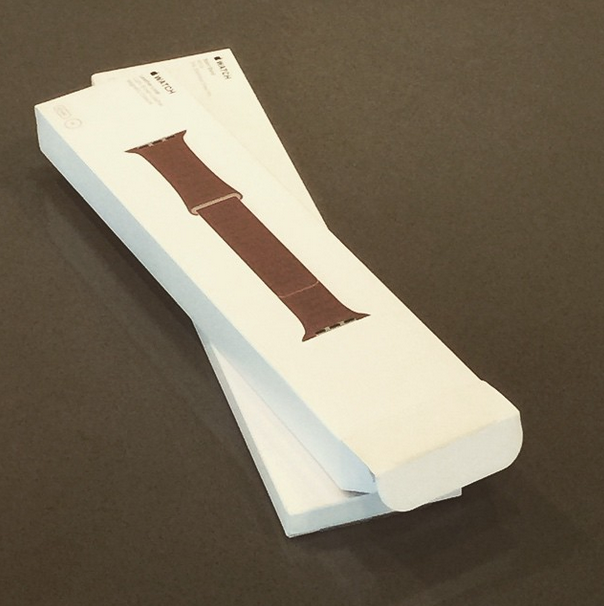 Jeremy Gan also posted a picture of an Apple Watch band package. The box simply shows a picture of the band and indicates the size. Additional Apple Watch bands can be purchased to give users more customization options with Apple Watch. The official Apple Watch packaging materials will be revealed when Apple releases the Watch on April 24th.